Since its inception in October 1986, the Virginia Wildlife Crime Line has become a valuable tool in the enforcement of the Commonwealth’s game, fish, and boat laws. As awareness of this program increases, so do the number of calls to report violations. The program has generated thousands of reported wildlife crime tips that have resulted in over a thousand arrests and over $80,000 in approved rewards. 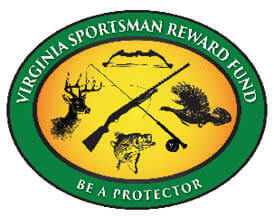 Reward payments are approved and funded through the Virginia Sportsman Reward Fund, Inc. Their mission is to promote the enforcement of hunting, fishing, and boating laws in Virginia by supporting the Wildlife Crime Line in cooperation with the Virginia Department of Game and Inland Fisheries. You can help support this effort by sending a tax-deductible donation to: Virginia Wildlife Crime Line, P.O. Box 90778, Henrico, VA 23228-0778. If you know someone who kills wildlife out of season or over the game limit, help the Virginia Department of Game and Inland Fisheries catch the individual and stop others from following that path. If you observe a violation, call the toll-free Virginia Wildlife Crime Line number at (800) 237-5712 or e-mail wildcrime@dgif.virginia.gov.